BANGKOK: I-Bhd, the master developer of i-City, plans to seal a definitive joint development agreement with Thailand's retail developer, Central Pattana Public Company Ltd (CPN), within two months to develop a mall within its flagship i-City Cybercentre in Shah Alam, Selangor. Chief Executive Officer (CEO) Datuk Eu Hong Chew said the mall, at a gross development cost of RM500 million and spans 1.7 million sq ft, is slated to start its physical construction works early next year and complete by end-2015. He told the media after the signing ceremony for the memorandum of understanding agreement between I-Bhd's unit, I-City Properties Sdn Bhd and CPN here yesterday for the purpose of working towards forming a joint venture through a special purpose vehicle (SPV) to develop the mall. "The mall will be developed through the SPV, in which I-Bhd holds 40 per cent stake while the balance of 60 per cent will owned by CPN," he said. He stated that CPN was chosen for the tie-up due to its expertise and experience as the group is now operating 20 malls in Thailand including Central World, which is reputedly the largest mall in Southeast Asia at 5.9 million sq ft.
"We are proud that CPN has chosen i-City to be its first foreign joint-venture in mall development," he said, adding that CPN is one of the foreign companies that has a joint venture with them to develop the urban cybercentre township. He said the company is currently looking for a partner to develop a data centre at i-City. Elaborating on the mall, Eu said it would be located within a 7.27-hectare plot in i-City and would complete the RM5 billion Cybercentre's offering as an international business by day and lifestyle haven by night. "Currently, we have already invested about RM250 million in the i-City Cybercentre project, " he added. Besides the mall, I-Bhd has also developed other properties such as a hotel, office tower, serviced apartments, and small office home office including a water theme park which will open in November this year. Meanwhile, CPN CEO Kobchai Chirathivat said the company is very keen to establish its name in Malaysia as the country offers huge opportunities for foreign companies to invest. "We see Malaysia as the best place to start our business outside Thailand as the country provides consistent foreign investment policy. Also, Malaysia is at the forefront of developing countries among the other Asean countries " he said. He added Malaysia is a good country to invest in as its average capital income is six per cent higher than Thailand, while its purchasing power is two times higher than its northern neighbour. 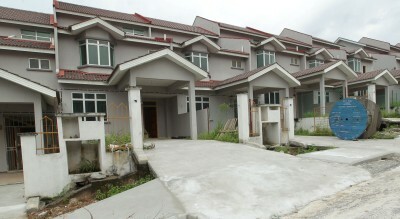 Close to completion: The Taman Selayang Permata housing development project is 80% completed. AROUND 20 housebuyers who had initially planned to voice their dissatisfaction over the developer’s delay in completing the Taman Selayang Permata project, received good news instead during a visit to the site. Some of the buyers, who have waited as long as six years since the signing of the sales and purchase agreement, were relieved when the project development company’s managing director Lin Lih Sen said that the project would be completed in two months. “Currently, the project is 80% completed. What is left is the landscaping and infrastructure work,” he said. Lin said the delay was caused by the lack of experienced engineers and consultants. “We had previously submitted the water supply system layout plans for Syarikat Bekalan Air Selangor Sdn Bhd (Syabas) but it was rejected. “We revised the plans and only received approval after submitting 13 plans,” he said, adding that it had delayed the project for 39 months. “We also need to repair the sewage system and once Indah Water Konsortium (IWK) has issued us a support letter, it will help us obtain the Certificate of Fitness for Occupation (CFO) from Selayang Municipal Council (MPS) for the houses,” he said. consists of two projects that include 28 units of three-storey semi-detached houses as well as 84 units of two-and-a-half storey terrace houses. Work on the terrace houses, costing from RM347,000 to RM534,000, started on July 22, 2005 while construction of the RM687,000 to RM1.28mil semi-detached houses started in August the same year. Both projects were scheduled to be completed in 2007. To-date, 77 units of houses from both projects have been sold. Representatives from the Housing and Local Government Ministry (KPKT) were also present during the site visit. Selayang parliamentary coordinator Jessie Ooi said a temporary committee consisting of housebuyers who faced the problem of delayed projects had been formed to discuss the issue. “I will also liaise with the developer and KPKT to provide them full support on the development,” she said. Temporary committee chairman Ng Chai Nea, who have waited an extra two years since the signing, said she had sold her house and was forced to rent a place while waiting for her new house to be handed over. “I hope the house will be completed on time as I wish to celebrate the coming Chinese New Year in the new house,” she said. PROPERTIES in Cyberjaya are starting to attract interest from foreign investors as the development matures and returns good yields. 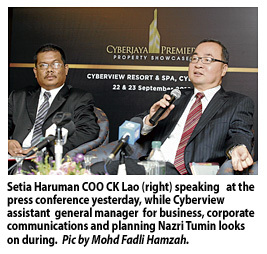 Cyberview Sdn Bhd assistant general manager for business, corporate communications and planning Nazri Tumin said Cyberjaya is on the investment radar of investors namely from Japan and South Korea. "There is a huge demand for Cyberjaya properties due to their good returns," Nazri said at a briefing on the Cyberjaya Premier Property Showcase here yesterday. Mah Sing Group Bhd chief operating officer Teh Heng Chong said the company has been getting lots of interest from Hong Kong and Singaporean investors for its properties in Cyberjaya. Most of the properties in Cyberjaya have been largely up market ever since its inception in 1997. The premium prices at the location, however, have not deterred even local investors to own a property there. UEM Land Holdings Bhd chief marketing officer Siti Mariam Mohd Desa said presently about 80 per cent of its property purchasers in Cyberjaya are locals. Setia Haruman Sdn Bhd chief operating officer CK Lao said demand for houses above RM2 million is still high with a take up rate that can reach 100 per cent for certain projects. Lao said there are over 20 projects ongoing in Cyberjaya currently with a gross development value of RM10.25 billion. He noted that there is a provision under Cyberjaya's development masterplan for affordable housing but that would depend on market demand. Meanwhile, the developers hope the government would relax rules on financing third property ownership and allocate more funds to improve public transportation accessibility in the Cyberjaya in the upcoming Budget 2013. The showcase, to be held on September 22-23, will feature seven developers namely Setia Haruman, Cyberview, UEM Land, Mah Sing, Glomac, MCT Consortium Bhd and Emkay Group. CYBERJAYA: Affordable housing could yet make its way to Cyberjaya but this would be dictated by the needs of the market, said its master developer. “We have a provision for affordable homes, but whether we develop high or low-end property, it will depend on the market. At the moment there is strong demand for properties above RM2mil, especially from recent launches,” Setia Haruman Sdn Bhd chief operating officer CK Lao said. “Some of the properties here were sold at close to RM1mil a few years ago and even then the take-up was 100%,” he said at a briefing on the Cyberjaya Premier Property Showcase. The showcase, to be held on Sept 22-23, will feature seven developers, namely Setia Haruman, Cyberview, UEM Land, Mah Sing, Glomac, MCT, and Emkay. Asked to elaborate, Cyberview Sdn Bhd assistant general manager (business, corporate communication and planning) Nazri Tumin said affordable residences were in the pipeline and would be announced “in due time”, possibly in the next few months. Setia Haruman, which oversees the overall development of the MSC-status zone, is a 75:25 joint-venture between the Emkay Group and UEM Land Bhd, while Cyberview is the city manager. Lao said a study carried out by the firm a few years ago revealed that a majority of those who lived in Cyberjaya were graduates, meaning average incomes were higher than that of other cities. “Our market is no longer restricted to people working in Cyberjaya,” he noted, adding that the main factor for this was the 30-minute drive time between KL and Cyberjaya via the Maju Expressway. KUALA LUMPUR: Kenanga Investment Research is downgrading property developers to Neutral from Overweight on potential worse-than-expected Budget 2013 risks and the closing general elections timeline. The research house said on Thursday that first, high up on its list of fears are hikes in buyers stamp duties, although it reckoned this measure is unlikely. “We think RPGT hikes are likelier, but this will have less physical impact on developers as the heftiest hike tends to be during the first 2-3 years holding period, that is during the construction period,” it said. Kenanga Research said notwithstanding, sentiment will still be affected and it anticipates a near-term knee-jerk reaction on developers' share prices in this scenario. “Even then, we still expect the physical market to continue in its current momentum given a liquid banking sector and attractive rates. As it is, most developers are meeting their sales target, except for UEM Land, which is another reason for our sector downgrade as we are cutting UEM Land recommendation,” it said. The research house said although it is bullish on Johor, there is a high risk of UEM Land not meeting headline KPIs as it is now proportionately behind its sales targets. “Our sector downgrade involves us re-basing most of our discount basis to widen our FD SoP RNAV discount rates to reflect our near-term cautiousness, although it is worth to note that on the positive side, most developers under our coverage are already approaching their forward PBV trough levels. “We are downgrading our ratings and TPs on UEM Land (MP; TP: RM1.85) and Hunza Properties (UP; TP: RM1.50). We are maintaining our ratings but trimming our TPs on IJMLAND (OP; TP: RM2.60), Crest Builder (OP; TP: RM1.34), SPSETIA (MP; TP: RM3.80) and MAHSING (MP; TP: RM2.40). “Our 4Q12 Top Pick is UOA Development (OP; TP: RM2.30) because of its strong net dividend yields of 7.6%-6.9% and its ability to meet its dividend commitments,” said Kenanga Research. Kenanga downgrades property sector Kenanga Research downgraded Malaysian property stocks to ’neutral’ from ’overweight’ as the upcoming Budget 2013 may bring fresh measures to curb speculations in the property market. An increase in real property gains tax is more likely than a hike in stamp duty and that either measure may prompt knee-jerk selling of property stocks, it said in a note on Thursday. Kenanga downgraded its call on UEM Land Holdings to ’market perform’ from ’outperform’ and cut Hunza Properties to ’underperform’ from ’market perform’. It said the delay in property launches at UEM Land may dent market expectations of the developer’s sales, while the lack of sizeable launches may hurt Hunza. Kenanga’s pick for the sector is UOA Development because of the company’s strong net dividend yields and its ability to meet its dividend commitments. At 1004 (0204 GMT), UEM Land was up 1.83 percent at 1.68 ringgit per share, Hunza was untraded at 1.48 ringgit per share and UOA Development was up 3.16 percent at 1.63 ringgit per share. Malaysia’s benchmark composite index was up 0.35 percent at 1,619.45. KUALA LUMPUR: LBI Capital Bhd says its unit Goldmount Resources Sdn Bhd has bought four parcels of land measuring 1.44ha in Sabah from Liew Leong Lok, Liew Leong Chin and Liew Leong Ting for RM6.7 million to develop a high-end condominium project. The 999-year leasehold land, expiring in 2909, is located at Signal Hill, on fringe of Kota Kinabalu city centre. The planned development is expected to boost LBI’s future earnings, LBI said in a filing to Bursa Malaysia yesterday. KUALA LUMPUR: S P Setia Bhd's earnings rose 10% to RM100.4mil in the third quarter ended July 31, 2012 from RM91.24mil a year ago, boosted by higher margin due to the continuous value-creation for its property projects. It said on Thursday the group achieved third quarter sales of RM1.045bil, bringing cumulative nine-month sales to RM2.855bil and remained upbeat for the remaining financial year. "This represents an increase of 34% over the RM2.137bil achieved in the same period of the previous financial year," it said. As at Aug 31, 2012, it said the group's sales for the first 10 months of the financial year totalled RM3.312bil, exceeding the group's full year sales for the financial year 2011. For the third quarter, S P Setia's profit before taxation was 26% higher at RM145.61mil compared with RM115.81mil. Revenue increased by 12.1% to RM654.19mil from RM583.47mil. Earnings per share were 5.21 sen compared with 5.15 sen.
On the performance of the property segment in the third quarter, it said the increase in revenue was mainly due to higher revenue recognition from residential and commercial properties in the Klang Valley, Johor Bahru and Penang as a result of increased level of overall group sales achieved since FY2010. Profit before taxation registered a higher percentage mainly due to the increase in the margin from 19% to 23% arising from group's success in steadily increasing the selling prices for its products through continuous value-creation. Ongoing projects which contributed to the profit and revenue included Setia Alam and Setia Eco-Park at Shah Alam, Setia Walk at Pusat Bandar Puchong, Setia Sky Residences at Jalan Tun Razak. Other projects were Bukit Indah, Setia Indah, Setia Tropika, Setia Eco Cascadia and Setia Eco Gardens in Johor Bahru and Setia Pearl Island, Setia Vista and Setia Greens in Penang. However, its construction segment recorded lower revenue and profit before taxation, down by 53% and 78% respectively. S P Setia said the completion of the Kementerian Dalam Negeri contract in Setia Tropika, Johor Bahru in the previous financial year has contributed to the current quarter decrease. In the nine-months end July 31, the group's earnings increased 8.6% to RM266.79mil from RM245.50mil in the previous corresponding period. Revenue recorded a 10.2% rise to RM1.763bil from RM1.599bil.